Love the way you travel, all across Canada. Enter the arrival city, station name or code, or the province. ID required with proof of age. The ISIC card will be accepted for those aged 26 and over for travel. Children under 8 years of age cannot travel alone. Children between 8 and 11 may travel alone, but under certain conditions. Please be advised that children's tickets are available through our web site only if you purchase tickets for one or more accompanying adults. Less than 2 years of age. Free if does not occupy a seat. One free infant per adult. If you wish to book a seat for your baby, please select "Child" instead. The child's fare will then apply. You can enter your corporate code, promo code, rail pass serial #, discount card serial # or free upgrade code. VIA Rail is looking to expand its teams with talented bilingual people. See our job offers now! You can now travel in cars with your loyal friends as long as the animals are small enough to fit comfortably in a carrier that meets our carrier standards. Beehives are about to arrive on some of our station roofs. Fast. Efficient. Fun. Relaxed. Get the trip you want every time. Work or relax on your way - now that's travel you'll love! Travel for a day or a weekend, your getaway begins as soon as you board. Whether you're going on an adventure or going back home for the holidays, you'll love the way. Within a few years, we'll be welcoming Canadians on board a new fleet of trains in the Québec City – Windsor corridor. 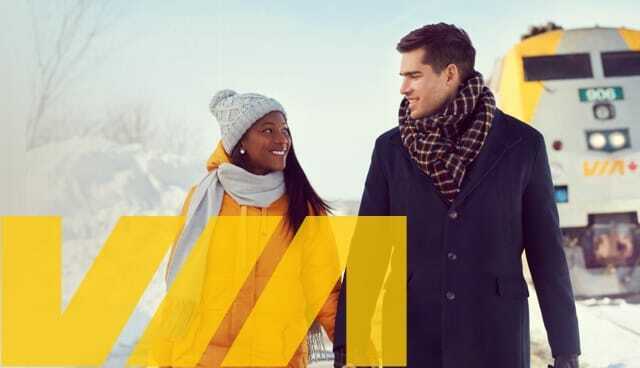 At VIA Rail, we are playing our part in shaping the future of mobility by making cities and communities more accessible, connected and sustainable. We aim to be the No. 1 transport solution for Canadians with reduced mobility or other impairments. Sign up to VIA Préférence and earn points toward free travel - fast! Subscribe to our train-alert service and follow your train in real-time on the location tracking map. Love to travel? You'll love our newsletter! Sign up for the VIA newsletter and we'll keep you up to date on the latest news, special offers and provide plenty of inspiration for your next trip! VIA Rail is looking to expand its teams with talented bilingual people.